Brief Synopsis: "A group of people try to survive an attack of bloodthirsty zombies while trapped in a rural Pennsylvania farmhouse. 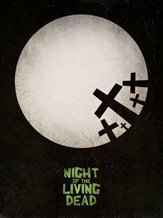 Although not the first zombie film, Night of the Living Dead is the progenitor of the contemporary "zombie apocalypse" horror film, and it greatly influenced the modern pop-culture zombie archetype." Steve Habrat 100 - The despondency, the growing frustration, and the ultimate defeat will live on in the cinema history books from now until eternity. One of the scariest films you will ever see. Drezzy 95 - The only zombie movie I can 100% say is better than the original Night is the original Dawn. Night broke down so many barriers and also invented the midnight movie craze, proving that b-grade horror films could, in fact, be a-grade FILMS while also reveling in the gore and misery of the situation. The bad acting, the cheesy (in hindsight only) special effects, and some of the more "whaaat?" choices of direction and narrative don't matter here because the sum is so much greater than any of its parts that it's ridiculous. One of the Top 10 horror films EVER. Colin Flanagan 80 - George Romero's "Night of the Living Dead" brought us zombies. His sequel is better, but this is still fun. Rob from GuysFilmQuest 70 - Not what I was expecting at all. Bryan Lienesch 61 - The original zombie flick. It's pretty obvious how this film unearthed (pun intended) our love for the undead.